CULVER — Triton played a pretty solid first half against sectional rival Oregon-Davis in Friday’s semifinal match-up at Culver Community. The Trojans shot at a better-than 42 percent clip from the floor — including 3-of-10 3-pointers — turned the ball over just six times and committed only five fouls. But in spite of all that, the Bobcats still led by a 13-point margin at halftime. The defending Sectional 51 champs didn’t make it any easier on them in the second half. OD pushed its lead out to as many 26 points in the second half, finished with four players in double figures and never trailed on the way to a 63-45 win over Triton, earning the right to advance to Saturday’s championship where they’ll defend their title against Elkhart Christian, a 58-53 winner over Argos in Friday’s late semifinal at Culver. 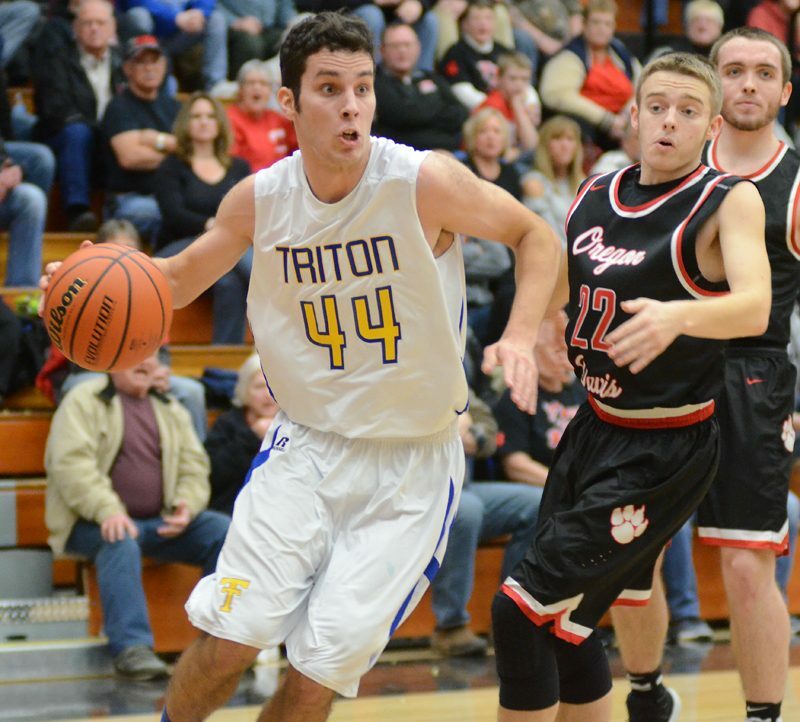 “They’re a good basketball team,” said Triton coach Jason Groves. “That’s what I told these kids: ‘What is it about these guys?’ And they all said ‘They’re skilled. They can shoot the ball. They can dribble the ball.’ And that’s kind of where we’re lacking a little bit. More than a few, it turns out. 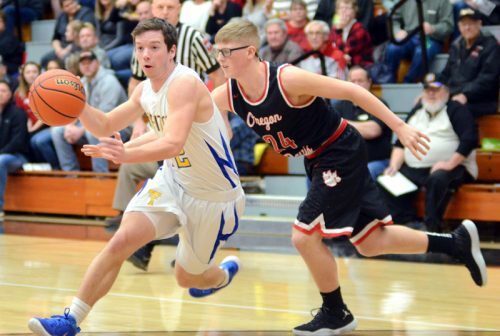 With Triton chasing OD shooters Jonathon Clark and Trevor Risner early, point guard Lance Campbell stepped up his offensive production with 11 first-half points. Freshman Dylan Murphy knocked down a pair of big first quarter 3s, too, as part of 7-of-13 3-point shooting by the Bobcats in the first half. The defending champs simply had too many weapons for the Trojans to keep pace. “They shot the ball well, and that’s kind of what I was dreading because we can’t really match up with them very well. I was hoping we’d be able to contest them a little bit more than what we did early,” explained Groves. Campbell finished with a team-leading 18 points to go with five assists. 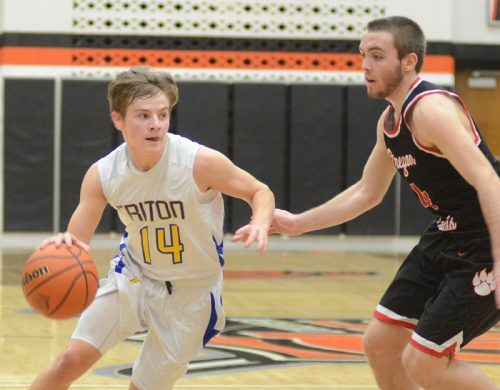 Fellow seniors Clark and Risner notched 14 and 13, respectively, and Murphy — a freshman playing in his first sectional outing — chipped in 11 points on 4-of-7 shooting as the Bobcats beat Triton for the fourth straight time Friday. Beau Hepler drives while Trevor Risner defends. Triton, by contrast, got most of its production from senior Ross Johnson, who poured in a game-high 23 points to go with five rebounds and two steals Friday. But after perhaps their most balanced scoring performance of the season in a win over South Central at Tuesday’s Sectional 51-opener, the Trojans struggled to find a whole lot of production from anyone else. Beau Hepler chipped in nine points but needed 11 shots to get there, and Drew Stichter scored six, but that was about it for Triton. With Triton trailing 52-28 in the fourth and a lot of ground to make up, the Trojans went to a 1-3-1 trap to try and turn the Bobcats over. OD did surrender five giveaways in the final stanza, but it wasn’t nearly enough to make up the difference. They went four corners early, limited the number of possessions and never looked rattled en route to the convincing win. “We have the senior leadership. We have guys that have been in this environment before. You’re not going to really throw a 1-3-1 press out there and it’s going to rattle them a whole lot. They got us a little bit and then we were able to settle down,” explained Eskridge. OD’s Dylan Murphy gambles against Triton’s Drew Stichter on defense, reaching around to jab the ball loose during the first half. “That’s one thing about them, it’s not just shooting and dribbling. They pass the ball, they see the court well. They know where each other is going to be,” Groves said. While OD (11-11), advances to play Elkhart Christian (16-6) tonight, Triton (7-15) closes out a tough season, the program’s first under .500 year since Groves’ first full season as head coach in 2005-06. The Trojans struggled with an inexperienced lineup and dealt with more than their fair share of off-the-court challenges as well, including the loss of their home gym to flooding damage in early January. Throughout it all, however, Groves said the team continued to battle. 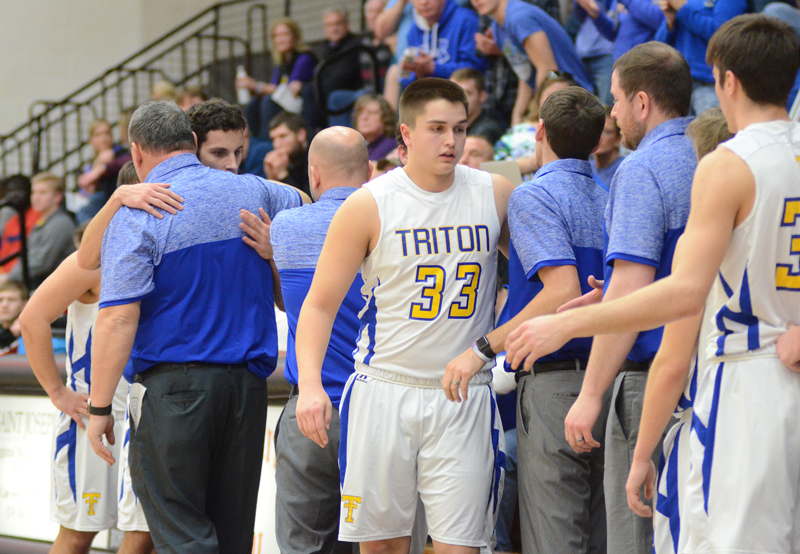 The Trojans now must say goodbye to four seniors in Warsaw transfer Johnson, Stichter, Dylan Hensley and Max Slusser, a group that helped lay a foundation for Triton basketball’s future. Triton’s seniors say their goodbyes after leaving the floor late Friday.